As a designer and researcher I use research through design or 'practice based research' to understand problem spaces through making. In this method sample I used a product design process to identify key questions as i investigated sustainability in the fashion industry. Living in Vancouver I had five rain jackets to meet the needs of different occasions. 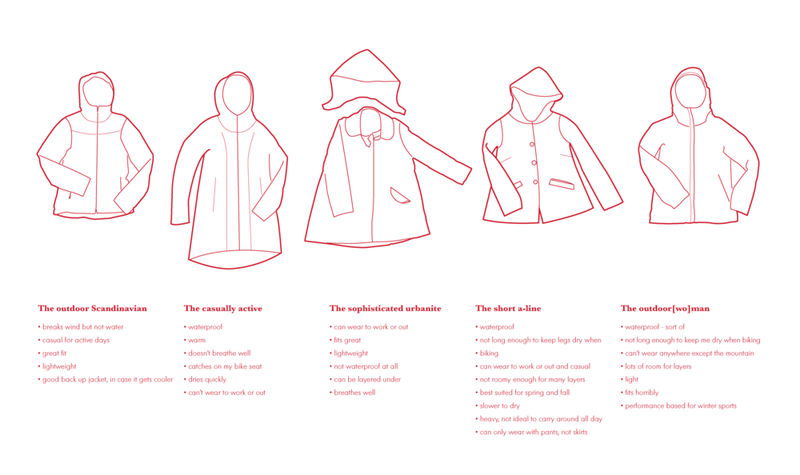 I was curious if I could design one garment to meet the needs of all five existing jackets, and what the process for doing so would look like as a service model. What if as a consumer, you were engaged in the design process? Would this lead to more satisfaction with the item, and could the volume which you consume decrease? The 5 to 1 project was an investigation into the value of user-designed garments. I wanted to explore how the experience of using a garment that meets your individual needs and tastes differs from buying off the rack. To do this I took five rain jackets of my own and identified each of their roles both physically and emotionally, and then compiled them into a new design. This diagram shows the five original jackets, and the value identified in each. I developed a set of narratives to represent each jacket in order to examine the emotive value of each. By evaluating the jackets through a narrative lens I was able to identify the unique value in each garment. The next step was to bring the value of each jacket into a single garment. In order to replicate this experiment I mapped the service in the form of a service blueprint. This process helped illustrate the customer experience and the backend processes required to engage users in the design of garments. Issues that were identified included the level of customization and consultation, and the essential requirement of duplicating the process efficiently for the model to prosper. As a generative research project there were two outcomes, the most basic being the criteria established for the garment designed. However the most valuable outcome was a list of questions, observations, and next steps that formulated further research in the problem space of clothing and sustainability.